For the month of April, all Probiotics are 20% Off. One new probiotic by Thorne research is Florapro LP. What are the special features of L. plantarum compared to other Lactobacillus species? Its unique genome allows this bacteria species to more easily adapt to different environmental conditions. It has a high tolerance for low acidic environments, such as the acidity of the stomach. It’s a species naturally found in high concentrations in lactic acid-fermented foods, such as sauerkraut, capers, and brined olives, as well as grape juice and wine. It has a pronounced ability to adhere to the mucosal cells in the GI tract. It has proven colonization in the intestines. L. plantarum is a major representative of the Lactobacillus flora in the GI tract of healthy individuals. It demonstrates an antibiotic resistance profile analyzed by Minimal Inhibitory Concentration testing. 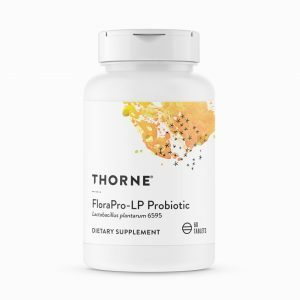 What are some special features of Thorne’s FloraPro-LP Probiotic – L. plantarum 6595? Proprietary Bio-Tract® technology protects this probiotic strain of bacteria from destruction by stomach acid. This same technology also provides a controlled, extended-release delivery that first begins to release content after the ingredient reaches the small intestine. FloraPro-LP is provided in small spheres (8 mm), which allows for ease of dosing, even in children.